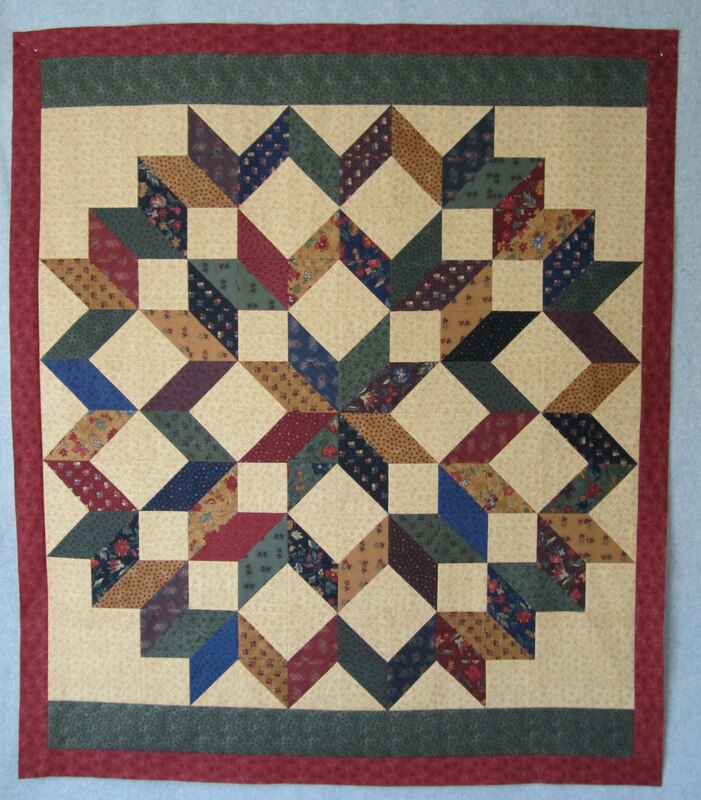 Cupcakes 'n Daisies: Quilt Number 60 . . . . . .
Oh Thelma! 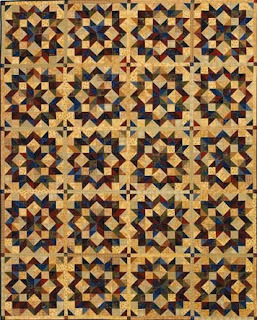 I love these quilts and I KNOW I have that pattern in the mag. It is somewhere on my "do" list LOL which I think runs clear around the house by now! Oh yes, I love the border you added!! The strips give it such pizazz. Buggy Wheels is a terrific pattern, I am in total agreement with you on the sashing. By the way, I am so glad you liked my cupcake post!! You definitely have to let me know what you think of Crumbs once you get to try them, YUM! Thelma, I know your father-in-law will love his quilt. It is so masculine looking but still pretty. You make such good color choices etc. It's wonderful Thelma...your FIL is going to love it! I really like the piano keys...they're always more work but the sure add so much to the quilt. That was fast! And it looks great! I wonder if the wagon wheels/buggy wheels could be a leader/ender project...it looks like a lot of piecing! OMG I can't believe you got the top done so quickly. My quilt...I mean your FIL is going to love this. congrats on number 60. I think I need to do an inventory and see what number I am at. have fun in Chicago! 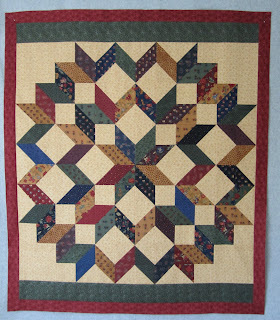 I love the quilt and really love the pieced border you added! I have the Buggy Wheels pattern too! Which I remembered after I bought the Wagon Wheels pattern LOL. But, after comparing them, they are different enough that I'd still like to make both. Buggy Wheels was already on my "must do" list to make in scraps, so I'll do that one in scraps and the Wagon Wheels in the Butterfly Garden fabrics. he (Lee) is gonna LOVE that quilt - it is HANDSOME! Thelma, your FIL is going to love his quilt. I love the border change you made. You have a great way of making each quilt your own. 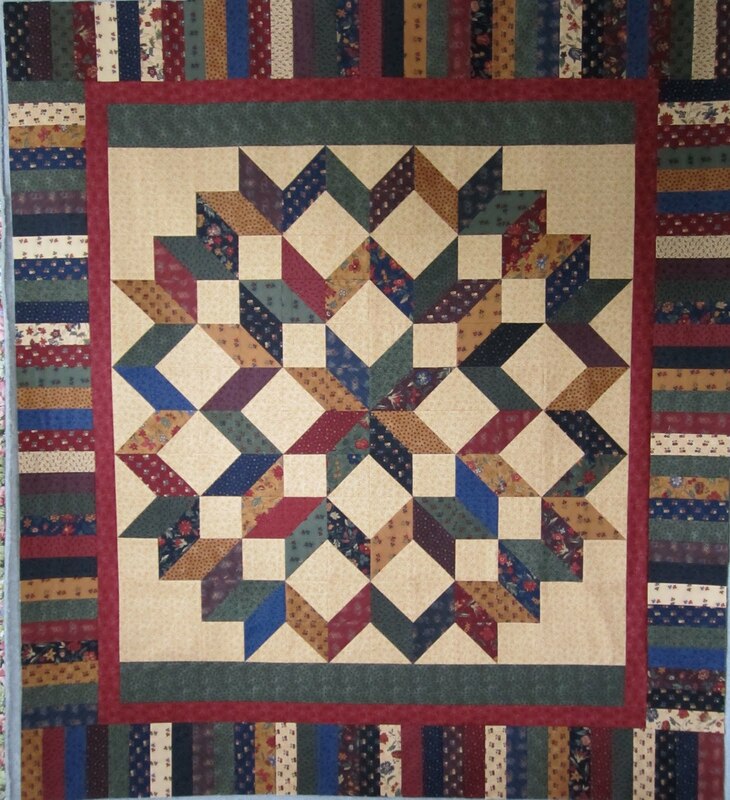 I made the Buggy Barn Wagon Wheel Quilt in 2006. I thought that I was going to die before I got it finished. But, it turned out beautiful and my sister in law loves it! My gosh you got that together quickly! I love the pattern and the fabric you chose. The wagon wheel design shows up nice and sharp. It will be a cherished gift. I didn't think I liked that pattern, but now that I see it in your colors and that great border, I love it! I'm sure your FIL will love it too! Great job on a another great quilt! Your fil will love it. The colors are great! I love the stripes around it...they add so much to it! Thelma - it looks great! I know your FIL will love it. Wish I had that pattern when I made a similar wall having for my mom a couple of years ago! I knew what I wanted it to look like in my head and had to futz to get it right(see it on my webshots here - http://home-and-garden.webshots.com/photo/2799103540101325500SkOERC I love this pattern. I love your quilt. The border really adds a nice touch. I have that same pattern from AP&Q clipped - its on my long, long list of wannamakes. Beautiful choice of pattern and colors. Very "manly" looking. I'm sure your FIL will love it! Such a pretty block!! I will have to look and see if I have a copy of that magazine. 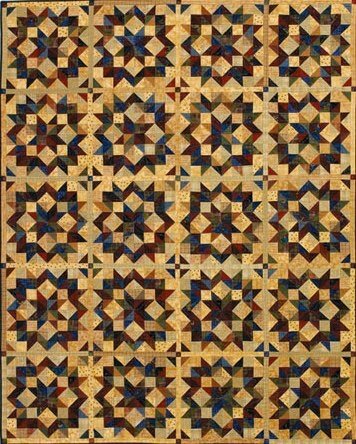 'Lee's Quilt' is so handsome! The colors are just right, and I love the border. I'm *crazy* about that Buggy Wheels pattern Sandy sent you and will have to explore the library to see if I can find it. 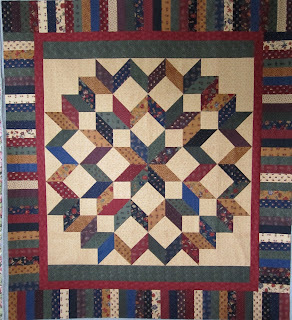 Love the border that you created for the quilt. It looks great. Well done! I am always impressed that you re-size patterns so easily. Do you use EQ to do so? No, I don't EQ, I just LOVE math! Sometimes, I read patterns, and rewrite the directions and resize the blocks just for fun!! I'm wacky that way, when I was in college, I did ALL the Accounting problems at the end of each chapter, not just the assigned ones, because I thought it was fun!